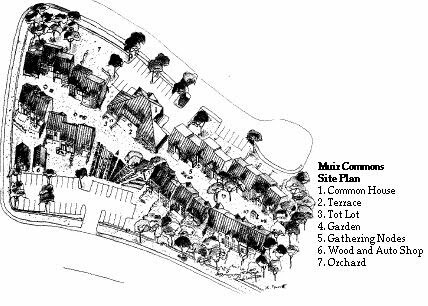 Muir Commons was the first community newly constructed in the United States modeled after cohousing communities in Denmark. After several years of planning, ground breaking took place on November 1990 with the residents moving in during the summer of 1991.
Who Lives at Muir Commons? Currently Muir Commons is home to approximately 45 adults and 35 children. Households include a variety of family structures. Most homes are owner-occupied, but several are occupied by renters. Muir Commons is made up of 26 homes on just under three acres. Each individual house includes complete kitchens and private yards. Houses come in three models ranging from 808 to 1381 square feet. The clustered homes face a central pedestrian pathway while the backyards face the outer edges of the site. Outdoor features at Muir Commons include a garden, an orchard, children's playground, lawns, and "nodes" to facilitate socializing. The extensive landscaping includes many drought-tolerant and native species. The 3,668 square foot Common House is the heart of the community and includes a large kitchen and dining area to accommodate community gatherings including shared meals. Other features include a sitting room with a fireplace, a children's playroom, an exercise room, a recreation room, an office, laundry room, and a guest room. Other shared facilities include a 900 square foot woodworking and automotive shop, parking areas, bicycle sheds, and a hot tub.